It is critical to evaluate the proper set up of your work environment because it is often the cause of most stress injuries, such as carpal tunnel in your wrist. Because many people spend almost half of all of their waking hours sitting at a desk, it is important that your chair, desk and other equipment help your body maintain good posture and alignment. A healthy work station involves being aware of your seating, keyboard and mouse, computer monitor position and glare, telephone position, feet position, lighting and proper positioning of your work. It is critical to evaluate the proper set up of your work environment because it is often the cause of most repetitive stress injuries. Things like improper chair position, cradling the phone between your ear and shoulder, or straining your neck to look at your computer monitor is not a big deal every once in a while, but when you do the same repetitive motions for several hours a day, several days a week, several weeks a month and so on, you will find that your body eventually has to give and in many cases will suffer pain, discomfort, poor posture and spinal disc damage. Unfortunately, most people don't correlate these problems to their day-to-day activity because they think it has to be caused by a specific traumatic event. That's just not the case. Check out these articles on what you need to know about proper set up of your work environment. Many computer keyboards now include wrist pads as standard accessories. 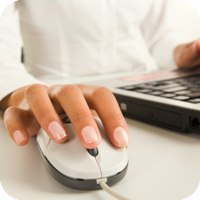 There are, however, ways to upgrade and enjoy the benefits of a liquid filled or foam pad designed to comfortably support your wrists while typing and using your mouse. If you are using a computer regularly, these are worth the investment.